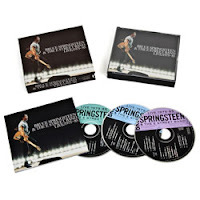 You are here: Home � All Deals , Media: Books Movies Magazines MP3s � Get 3 CD's worth of Bruce Springsteen and The E Street Band: Live between the years 1975 and 1985 on sale for $19.99. Get 3 CD's worth of Bruce Springsteen and The E Street Band: Live between the years 1975 and 1985 on sale for $19.99. Get 3 CD's of Bruce Springsteen and The E Street Band: Live between the years 1975-85 for $19.99. This offer comes in a boxed collectors set, and has really all of the early Bruce you'd want. Here is a list of a few: Because The Night, Born in the USA, War, Fire, Thunder Road, Seeds just to name a few... plus an additional 59 others in the disc set. You end up paying 31 cents a song to listen to LIVE concert recordings of Bruce and the E Street Band.